Please note: We're professional traders, not professional camera men. In hindsight the lighting could have been better in the video above but I think the message is still clear. Only after watching the above video scroll down to read a David Jenyns' letter. How YOU Can Increase Your Trading Profits With A System That Works In Any Market, In Any Time Frame. From: David Jenyns - Dip Fin. Professional Trader, Author and Coach. Date: 9am 12th May 2008. Have you ever seen a website selling a trading system that sounded too good to be true? I often wonder if the people selling these courses are actually making money through trading or if they're simply in the business of selling courses. Have you ever purchased a trading system only to find that it didn’t quite suit your risk level, time available and/or trading float? Chances are you’ve purchased one of these grey or even black box systems at least once - I know I have. Have you ever placed a trade and seen the market move almost immediately in the opposite direction? When this happens, it almost feels like the market knows you’ve purchased and decided to move against you. If any of these situations sound familiar - you’re just like me. Well actually, I might have taken it one step further in my search for the holy grail of trading. I've struggled for many years and spent many sleepless nights toiling away "in the dark" in my system testing lab like a mad scientist. Overall, I`ve had a lot more systems that were "losers" than "winners." But today, almost every trading system I design is profitable. Why? Because I follow a step-by-step methodology that I learned from my trading coach. stop messing with the "losers." They are a complete and utter waste of time and money. ways to design profitable trading systems. I am just sick and tired of all the nonsense that`s going around. So what was my turning point? Around 7 years ago now, I was introduced to a trader unlike anyone I had ever studied. At first I thought this guy was a natural – I mean, he seems to make money no matter what the market conditions are (even in the current climate). I’m of course referring to Stuart McPhee (featured in the video at the top of this page). I was lucky enough to be personally coached by Stuart and, upon closer inspection, his talent wasn’t so much innate as it was learned while serving as an exchange instructor with the US Army in El Paso, Texas. I believe his 10 years in the army not only gave Stuart a rock solid discipline which he uses to extract non-stop trading profits from the market but it's also directly responsible for his ability to teach these methods to others. I've been telling people for a while now that Stuart is one of the greatest trading coaches of all time. And he's honestly one of the nicest, most down-to-earth people you'll ever meet too. Seriously. Finally it seems people are starting to take note! 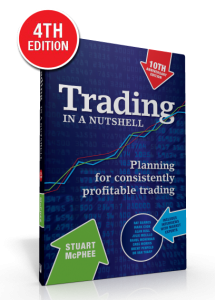 With his book, Trading in a Nutshell (4th edition), and speaking engagements around the world – Stuart is in demand like never before. Stuart still trades professionally, actively coaches traders on a personal level, writes for the Australian Stock Report and runs workshops around the world. Sadly, there’s zero chance you will ever get the one-on-one coaching I had that transformed my trading – Stuart’s top level coaching program is booked out solid for the next 18 months and that's not to mention the $360 per hour price tag! With that that said, Stuart is a close friend of mine and as a favour to my coaching clients, friends and subscribers, late last year he conducted a closed door training for a small group of traders. 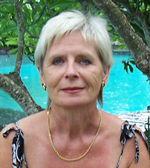 The workshop was called Triple Your Trading Profits – and it was a tremendous success. Knowing full well the demand for Stuart’s time, I requested that we professionally record the event so we can help more traders than those in the room on the day - I appealed to Stuart’s desire to change the lives of traders around the world… he agreed. "I am up $5000.00 at this moment in the last three weeks." "Hi David & Stuart I think the Triple Your Trading Profits is a great Home Study Program and one that I can refer back to as often as I need. 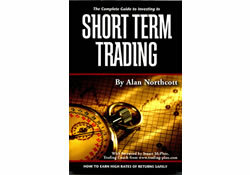 I have been through the trading DVD, s and I think that they are an excellent training and future reference tool. I would have no hesitation in recommending the course to any of my friends. They are extremely well presented and simple way especially the Kiss principle. My previous problems have been in the discipline and patience area, especially in this market. The material is well presented and very easy to follow, previously I have set stop losses on shares and the share price has just reached my stop loss [I was stopped out] And immediately turned around and headed back up, this has happened regularly and it is extremely frustrating to say the least especially when the trades have been correct. In one of the first trading dvds there was a woman who talked about her impatience some times it helps to know that other people make the same mistake so I can relate to what she was saying. I have three trades and am using GSL I am up $5000.00 at this moment in the last three weeks. So yes using your system and having a Trading Plan I will make money for my wife and myself. Especially as I am now focusing on the plan entry and exit before I even buy the Shares or CFDs this is a complete turn around from what I used to do I would buy the shares and then set my stop loss. The Q & A series is a great add on to the course and one that I can continuously refer back to as needed. The other thing that I like is the course notes which I can use as a ready reference I made my own notes while watching the dvds as I find this is the best way for me to remember . With Best Wishes and Rewarding Trading." "Best piece of investment dollars I have spent in the last 5 years"
"Let me just say that after receiving your TYTP goods today at work and then staying up all night watching it that I thought it was the best piece of investment dollars I have spent in the last 5 years. David, in my view, Stuart and yourself are at the forefront of trading system innovation and provide an amazing conduit for people willing to listen and the apply your methods. Trading is not easy, but anybody that is serious about MAKING MONEY (and who isn't for all the reasons) can advantage by applying your methods. WELL DONE GUYS - I am not sorry to say I spent the money on you, KNOWING that my system WILL be successful as it has positive expectations- I don't need to watch the market now and be glued to my seat, MY SYSTEM will do it automatically and I can cut the emotion out of trading and apply my hard earned money knowing that it will be predictably positive in the long-run." "My profit would have been at least $10,000 U.S. dollars"
"I enjoyed the presentation very much. Stuart is very confident, and at the same time very personable and warm. By viewing the excellent and clear videos at home, I felt like I had a personal trading coach right with me -- a person who knows what I am up against. It is like I was able to pick up some of Stuart's confidence directly -- through the visual and voice qualities with which the material was delivered. I am excited to have the experience with Stuart from which to move forward. I learned what to emphasize and what not to emphasize, in line with the relative priorities that the "Market Wizards" focus on, and to which they owe their success. In particular, I learned how to address "risk", with the remarkable insight that I can (and must!) actually control the risk by addressing it correctly. The point is to not allow my emotions to override the logical approach which is needed. In the past month I was confronted with a possible trade in a stock that I currently own, where it was at a depressed price and near support, with an earnings announcement due. If I had had the Triple your Trading Profits course at that time, I would have been able to see the risk and opportunity in perspective, and would have had the requisite confidence in my trading approach. With that perspective I would have jumped at the opportunity to take on a significant position. My profit would have been at least $10,000 U.S. dollars, while putting only one per cent of my trading capital at risk! So the value of the course to me is well into the thousands of dollars. And the material is unique in that Stuart puts a major emphasis on Mindset and discipline, which I can see is something that the great traders have in common. He does not try and push some needlessly complicated and specialized technique. Most of us already have seen enough techniques to keep us eternally confused. His point has been to de-confuse us, so that we can move forward, learn what works best for us, and preserve our capital in the process, by using proper money management. Paul Kusinitz, Lexington Massachusetts, USA., Retired aerospace engineer. "The bonuses alone are well worth the investment." I am just astounded that you guys have put so much in a course for such a small price. The bonuses alone are well worth the investment. But then to have a functional trading program in addition is another huge bonus. Besides that there is the back up support for questions and answers that I think of as a mentor program. The course is jam packed with information that you would need to glean from a stack of books and other courses then digest into one useable system. You don't need to offer a money back guarantee because no smart trader would use it. You guys must have put an enormous amount of time into compiling the contents of this course. I have never purchased any book, system or package with as much practical, relevant and useable information combined into one course. Well done gents! And if you can't make money from this course then stop trading! I also think you have very aptly named your course because that's what it will do for serious traders." Watch some video testimonials below recorded live at the Triple Your Trading Profits workshop. Click Here to read many more testimonials. 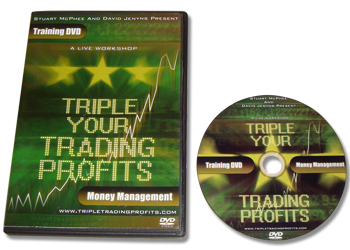 Introducing the Triple Your Trading Profits Workshop Trading DVDs. Finally discover the secret trading methodology Stuart McPhee uses to design profitable trading systems. Click here to get your copy. Let’s take a look at everything that’s in the course. Here’s some of the things you’ll discover on my trading DVD 1. Here’s some of the things you’ll discover on the DVD 2. Here’s some of the things you’ll discover on trading DVD 3. Here’s some of the things you’ll discover on trading DVD 4. You’ll also receive the exact same 116 page printed manual that the seminar attendees received. Please note: this is not just a copy of the powerpoint slides, or the transcripts of the presentation, like you’ll get with many other trading courses. 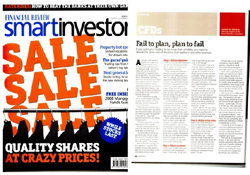 Instead you'll also receive a huge collection of Stuart McPhee's top trading papers, articles and reports. There are 37 hand picked articles that cover many of the trading DVD topics in greater detail - I like to call them “A Lifetime of Lessons”. How Can You Measure Volatility and How Can You Use It? How You Can be Sabotaging Your Trading - and Not Even Know It! … and there’s 28 more. I believe this manual alone is worth your entire investment in this course! Click here to get your copy. This is short and sweet. 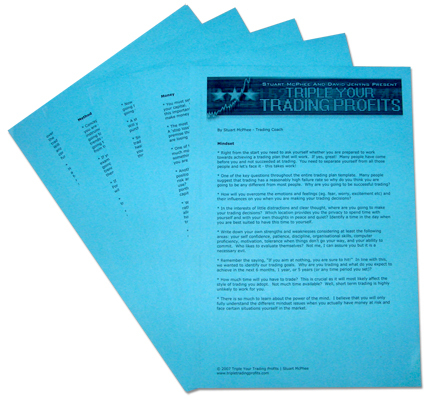 This is the first thing you should read when your Triple Your Trading Profits course arrives. This guide is designed to ensure that you avoid the “deer in the headlights” stage. Yes, this course is big and meaty… but this quick start guide will give you a clear vision on how to move you through the course quickly and efficiently. This blueprint gives you a step-by-step process for designing a trading plan that works. It will make a very handy reference guide – ensuring you’re always on track. How many times have you bought a course and tried to organize your notes into an easy-to-follow summary? It takes a lot of time and effort, and you still find yourself referencing the source material - that's why Stuart created this awesome blueprint. It'll turbo charge your learning curve! Click here to get your copy. Last but not least is the data disc… and there’s actually a few goodies on this CD. In the lead up to the workshop Stuart and I took subscribers' questions and answered them candidly with our mp3 interview sessions. You’ll have access to all these audios, in addition to the exclusive (unreleased) follow-up Q&A sessions. "What exactly does "reasonable profit targets" mean? If its reasonable to have a target of 5-10% per month in stocks, then is it not reasonable for it to be 50-100% in highly leveraged markets?" "When do I exit a trade ? It seems fairly easy to get in a trade and find stocks that rise, but when should I get out before seeing my profits vanish ?" "Isn't everything we need to know shown in a chart (price bars/volume/trends/patterns) and aren't all the other indicators just gimmicks?" Discovering the answers to these questions might just be the final piece in your trading puzzle. Click here to get your copy. Sign up now, and you can listen to our completely free Triple Your Trading Profits audio preview series. You'll immediately be able to download audios where both Stuart and David answer subscriber's trading questions. Just enter your name & email - then click the “Let me download my first audio!” button. (All information kept 100% confidential). We take your privacy very seriously. Our personal privacy guarantee to you is that we respect your privacy and will never share your email address with anyone. You can easily unsubscribe at any time. Before you get all excited, I must confess, this course isn't for everyone. No offence, but if the following describes you, I won't accept you into this program. Are you looking for the Holy Grail of trading? That is, a“system” that will magically give you buy and sell levels that you can email or fax to your broker. If that's what you're after I hate to burst your bubble but those systems never work! This isn’t Disneyland. The markets are full of wonderful opportunities… but only if you have designed a trading system to extract these profits. This course is for serious traders (or serious beginners) who know that it takes work and knowledge to succeed in the markets. If you are willing to put forth the effort, then Triple Your Trading Profits is the blueprint that you need to read the markets and profit from them. You’re probably wondering what this course is going to cost? When you consider Stuart's coaching rate is $360 per hour and you'd need a minimum of 12 sessions to cover the same material, that's $4044 worth of coaching right there. Moreover, mindful of the fact that many trading courses sell for up to $2000, you’d be forgiven thinking this package was going to be high priced. The long and the short of it is, neither Stuart or I need your money - with our trading methods, we’re now set for life. We’re not looking to get rich selling this home study course – that said, it’s also a fact of life that unless someone exchanges value for an item they simply don’t appreciate its worth. So here’s what we’ve decided. You can invest in this entire package for only $337AUD. If you are among the first 200 buyers, then you will be invited to attend 3 follow-up Q&A sessions. Sometimes you never know you had a question until someone else asks it for you... as part of our continuing support, we'll be holding follow-up teleseminars to ensure every last question gets answered. You will have an opportunity to submit your questions and have Stuart answer them in a live recording. During the Triple Your Trading Profits workshop Stuart touched upon his favourite charting patterns and what he considers are the key reversal patterns. Due to time constraints Stuart agreed to record 2 short bonus presentations on both topics for the workshop attendees. They're yours free if you're one of the first 350 traders to purchase. 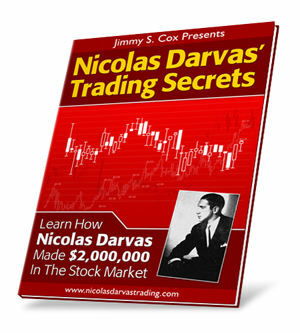 Jimmy Cox has now kindly allowed me to include a copy of his Nicolas Darvas Trading Home Study Course. This course details the precise entry and exit rules Nicolas Darvas used to make 2 million dollars in the stock market – it’s also the same method I use to trade the markets! This course was only ever offered to 200 of my private clients. It sold for $97 and is an awesome bonus when you consider it’s not currently offered to the general public. 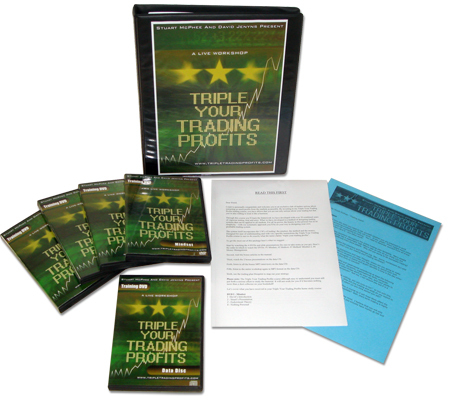 Yours free when you purchase the Triple Your Trading Profits DVDs. Your purchase is risk-free. Give the Triple Your Trading Profits a try for 60 days. If you aren’t completely thrilled with the course, then we don’t want your money. Simply return it within 60 days of your date of purchase and we’ll promptly issue you a refund for the entire course. Click the link below, enter your details and approve us charging your credit card $337AUD. Shortly you'll receive your copy of this amazing course. We use “Paypal” and our own in house merchant facilities - depending on which method you select. All credit card orders will be processed in Australian dollars. All orders are processed manually and as such can take up to 48 hours to complete. People get very emotional about trading when they have invested their own money. Think back to your last trade - maybe it was earlier today, maybe it was a few days ago, maybe it has been longer. Did you feel any emotion when you placed the trade? Did you have any butterflies when you were in the trade? Did your emotions change as the market moved for your trade or against your trade? Most traders, even the most experienced traders in the world, will admit to feeling these types of emotions. Even if the emotions are well hidden and you can never see it on their face or hear it in their voice - they are still there. Successful traders combat these emotions by planning their trades and trading their plan. 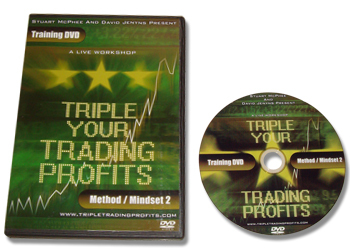 The Triple Your Trading Profits workshop trading DVDs will give you the methodology you need to do the same. It was designed for traders just like you, by traders who started where you did. Follow in our footsteps… we look forward to sending you our best trading tips, tricks and strategies. Professional Trading, Author and Coach. "My name is Chris Conway and I have been trading for approximately 2 years using a medium-term approach. The presentation of the material by Stuart and David was clear, concise, and - most importantly - practical. The quality of the insight they offer is second to none, not only in pointing out the deficiencies one may have in their trading system, but also in providing solutions and guidance to improve your trading overall. I would highly recommend the course to traders of all experience and expertise level who are serious about improving their trading." "TYTP was great! I'm a 19 year old who is really new to trading, so when i say that i heard and understood everything that was said at the seminar, its no small statement. The insights are very clear and were the kick start i needed to get me on the road to becoming a successful trader. My dad has been trading for several years now, and he also told me that he got a lot out of this material. I highly recommend this to any trader or prospective trader out there. "I flew in from Adelaide for the event and I am glad that I did. Both Stuart and David have a wealth of experience, are good teachers, and genuine. I have been trading the FX markets for a few years, on and off. After the event I have turned my focus to money management and cultivating a more disciplined approach to trading. Many thanks." I would like to say thank you for your workshop last Saturday. The day was definitely worth the time and effort to fly in for. I imagine like many others I was looking for “Your Method” of trading particularly, exits, as I had already come to the conclusion that this is the most important aspect of keeping your losses to a minimum and maximizing your profits. Well you did not give me what I was looking for but much - much more. My trading plan includes risk management- Money management – entry Rules and any number of ways to exit a trade based on ATR’s or lines etc. What I had never realized before that they are all interdependent. Many of my trades have been failures due to the fact that my stops have been set close to preserve capital only to find I have been stopped out and the market then turns and goes on its way back up. Like someone else in the audience that day I can think of many times I have picked the dead bottom of the move as a stop. I am now modifying my plan to tie in Risk and Money management rules to help keep me out of the trades I can not afford to have a long enough stop on. You do not appear to place much emphasis on your entry and I was pleased to hear that. I talk to myself and relate the trading strategy I want to adopt to a bus ride. If the bus is going in the direction I want to go - get on and stay on till it changes direction or I arrive at my destination. It does on matter where I get on, so long as the journey is long enough to justify the fare. However, I still look for the entry method that will give me, what I think, will give me the best opportunity of success. I am looking forward to the day when my confidence and competence allows me to not waste the time looking. For now the looking gives me plenty of opportunity to study the charts and recognize patterns and behaviors of certain stocks. So I consider the looking and entry analyses a good education for now and a process that will be less important as my confidence increases. Thank you for hammering away at the mindset and how important it is. Some years ago I trade the SPI and even cross traded pork bellies and corn or some other crazy thing. Through some sheer luck, I had some successful trades but over time I lost all the money in the trading account. The worst thing for me was not losing the money but the sleepless nights and worry I had. I did not have the correct money and risk management policy. Every trade was like standing astride a barbed wire fence and then finding out it is also electrified. Now with better money management my mindset is better and I can relax. Even recent loosing trades I am relaxed about and consider successful because I have a plan and I stick to it to the letter. All I need to do is refine it as mentioned above. Stuart and David, this letter started as a simple thank you for the workshop, it has also been good therapy for me. I hope it gives you some insight from the perspective of a trader who has had too many losses but believes he can and will be financially successful. There is no doubt in my mind that when I do get there much of my success will be due to the philosophies you guys teach. Have a great Christmas and I look forward to catching up with you again sometime someplace." "I wish I had attended your workshop before I started trading because successful trading requires more than just knowing when to enter and exit. Your presentations are crystal clear and the recordings are professionally made. I feel as if I am there myself. This is definitely one investment that is worth taking where the risk is low while the returns can be very high if applied with diligence"
Hong Chin Weng Miri, Sarawak, Malaysia. I received the package in 5 working days. Very efficient. I must admit I was a bit wary prior to watching the DVD's. Having wasted so much money in the past in various courses and seminars. I did start off thinking that I had heard it all before. But all of a sudden there was something different. For a start one of the gentlemen stated that most of us do know about cutting our losses and letting profits run, also money management. But that one word. Implementation. How right you are. How many books have I read quickly, with the intention of re-reading and making specific notes, only to be excited about the next one. My desk is piled high with books to finish or read again. And yes 'The trading plan', we know what we are meant to do, but in the heat of the moment, somehow it all gets forgotten. I found Stuart's presentation very easy to watch. I especially liked the fact that you have been 'there' not so long ago, and made all the mistakes that I have made. Hope for me yet. The most important thing that I have got from tytp so far is Crossing of Trading Styles. I have missed so many good profits with CFD's because I have let my profits run and they have ended up 'running' in the opposite direction. So I had a yo-yo effect without actually making any money. I am now writing two separate trading systems, for both CFD's and longer term shares. By changing my CFD style I have already paid for the course. My intention is to make a diary note to watch the DVD's on a regular basis. Good luck guys and many thanks." Shortly before the dot com bust I made a decision, to divest all my share holdings. Having realised that I was not trading with any sort of plan I was becoming increasingly uneasy. More by luck than good judgement I was spared from the great losses that many others incurred. It has been many years since then & I have always had in the back of my mind that I would return to share trading as soon as I could formulate & write down a suitable trading plan. Over the years I have done some courses, read many books and conducted a lot of research on the internet, adding to my knowledge of share trading. More recently, I have set myself a goal to begin share trading again as soon as I had devised a written trading plan to suit my needs. Discovering, Triple Your Trading Profits has given me a great tool to go about creating my trading plan. The material and its presentation are excellent. It pulls together a lot of concepts and ideas that I had seen from other resources and presents them together in a logical cohesive manner. It has shown me a way forward for compiling my own trading plan, and will be a valuable reference tool I can return to again and again for ideas and inspiration. I definitely believe I received good value for my investment. It was the next best thing to actually being there!" Stuart first mentioned his project to produce a trading DVD set to me in Shenzhen, China in December 2007. We were both at the Asian Traders and Investors Conference (ATIC) where we were invited to present to Chinese traders. Stuart was excited about the prospect of getting his message about trading success out to as many people as possible who couldn’t attend his trading Expo presentations through the DVD medium. And Stuart should be excited because I believe he has done an excellent job, not only in the content provided in his DVD set, but also the professional presentation for both the DVDs and comprehensive manual that accompanies it. Now let me tell you a little unknown secret about book/product reviews. It’s very unusual for a reviewer to read an entire book or watch a complete set of DVDs. They usually flip through the content, get a good sense of the flavour and develop a fairly accurate opinion very quickly. Well Stuart is a friend of mine so I watched the complete set of DVDs! Yep, I listen to over 6 hours of Stuart talking to his audience. So listen up, this is a fair dictum insight into Stuart’s DVD set. First up, although from an eye catching marketing perspective I love the “Triple Your Trading Profits” title, I would have preferred it read something more along the lines of “Foundations of Successful Trading”. The DVD set is not devoted to trading tactics that many aspiring traders would associate “Triple Your Trading Profits” with. So don’t expect to learn multiple new ideas for trade set-ups, entry and exit techniques. What Stuart and his trading DVDs do so well is clearly and expertly explain the essential necessities for trading success, the foundation stones every successful trader builds their career on. Each DVD is devoted to a particular foundation piece. Beginning with psychology Stuart dissects how a traders mind can easily, and frequently, sabotage their performance and why it’s so important to get the mindset right. He then moves onto to discussing a trader’s methodology and why it encompasses far more than what the average trader thinks. To Stuart methodology expands beyond the concept of set-up, entry and exit. The trading DVD set finishes with an essential discussion on money management. For those who are either too busy to watch the DVD or would like to listen to it again as a reminder on their way to work can listen to an MP3 recording that is also provided. 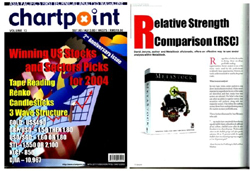 In addition to the DVD set Stuart provides a bonus set of articles containing many valuable trading lessons. Throughout the DVD Stuart peppers his presentation with market stories and memorable and powerful quotes from significant people to underline the importance of his message. I found it a very effective teaching tool. I’ve had the pleasure of listening to Stuart and I can say the DVD set gives a true and accurate impression of him. He is a clear and articulate presenter with the ability to make difficult subjects sound simple. I believe this is a unique opportunity to learn from a considered expert in the field of developing successful traders. As a well known trading coach and popular speaker who has presented to traders in Australia, New Zealand, Malaysia, Singapore, Thailand, Vietnam, Japan, India and China (yes folks, Stuart is a considered expert in this field) this is an opportunity for you to listen and learn in the comfort of your own home. However, you will be required to not only listen but to comprehend and act. It will depend on you how much you will benefit from Stuart’s DVD. It will depend on your attitude. Get it right, embrace and implement Stuart’s messages and you will start thinking and behaving like a successful trader. I would recommend Stuarts DVDs to those aspiring traders who are not looking for that one magical silver bullet indicator but who are serious about learning the real foundations of real trading success to increase trading profits. I'm not sure why I like Stuart and David's work so much on Triple Your Trading Profits. Well... I do have a couple of ideas why. One reason is that the only "hype-ish" element in the program is the title. The contents of the DVDs/workbook is right-to-the-point and really hits the target as to why traders who should be winning are not... then gives you the plan to correct it... and not just a "trading plan", but the plan to be a confident, disciplined trader. Anyone who knows me knows my emphasis on trading psychology and it's importance to successful trading...and THAT essential element is what's missing from most "courses". Not this one. Stuart EMPHASIZES the right things in this course to make sure that when you finish the course, you'll have all the tools to be in the winning minority of traders, not the losing majority. Then, it's up to YOU to take control of your trading. This is where he acquired most of his skills as an educator and has since used them extensively with the personal coaching work he has done. Stuart is recognised as one of the leading trading coaches in Australia. More importantly, he is one of the very few people who makes the effort to coach traders personally in their own homes at their trading desk, as opposed to cramming heaps of people into a seminar room. Stuart has also contributed to a number of daily newsletter services and written training notes for national training companies. Stuart has presented lectures at the Australian Securities Exchange, at Traders' Expos around Australia, for the Australian Technical Analysts Association, and at the Asia Trader and Investor Convention in Singapore, Kuala Lumpur and Ho Chi Minh City. Stuart was interviewed by the VN Express newspaper in Ho Chi Minh City. Stuart now trades professionally, actively coaches traders on a personal level, and runs workshops throughout South East Asia concentrating in Singapore and Malaysia. He also regularly speaks to smaller traders clubs and informal groups of traders and investor clubs. 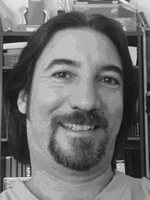 David is recognized as the leading expert on both MetaStock Professional and profitable trading system design. 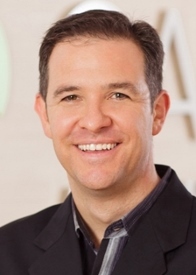 He earned this title after working at Ord Minnett (one of Australia’s top brokerage firms) and training hundreds of traders at HomeTrader (Australia's leading stock market education company). 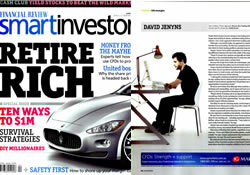 Featured in many trading journals and magazines, including Chartpoint, Smart Investor, Your Trading Edge, Short Term Trading and the Guppy Traders Newsletter, David's trading methods give readers immediately actionable strategies. David advises, "Trading is not a get rich quick philosophy. It is a profession that takes time to master but the rewards are worth it." He consistently motivates scores of people to succeed in trading the markets … now – it is your turn. Disclaimer - Forex, futures, stock, and options trading is not appropriate for everyone. There is a substantial risk of loss associated with trading these markets. Losses can and will occur. No trading systems or methodology has ever been developed that can guarantee profits or ensure freedom from losses. No representation or implication is being made that using the Triple Your Trading Profits methodology or system or the information in this letter will generate profits or ensure freedom from losses. Find a Forex Broker. Or read the Forex Indicator blog to learn more about various indicators and trading strategies. Copyright © 2001 - 2008 Trading Excellence, Pty Ltd.